Some old greeting cards — Many of the ones we received last year had no writing on the inside left, so we used those. Ribbon – I found the 1/8″ wide or 1/4″ wide work best. Clear Contact Paper – Optional. Have your child cut out the shapes from the greeting cards. 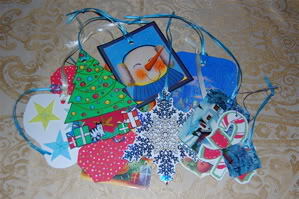 You can laminate these with clear contact paper, and use wipe-off marker to have re-useable gift tags! Punch a hole in the top of the card, and thread some ribbon through. Great idea! I’m glad to see someone else recycles old cards. My frugal Friday post included doing the same thing.